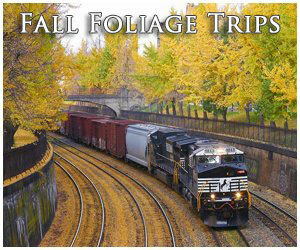 Vermont train rides offer spectacularly scenic views within the heart of New England. 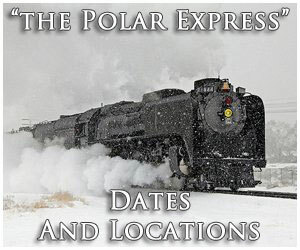 There is currently only one company which provides such an experience, the Green Mountain Railroad based in Burlington. It is a division of the Vermont Rail System, a successful short line which operates much of the state's old Rutland Railroad. This venerable carrier was not Vermont's first railroad, only maintained a network of 400 miles, and struggled financially for years. However, the "Green Mountain Railway" served its home state well and was a vital transportation artery for more than a century. It remains fondly remembered today for providing local freight and passenger service from Bennington to Alburgh. What began as the Champlain & Connecticut River Rail Road in October, 1843 (to connect Rutland with Burlington) finally passed into history 117 years later. 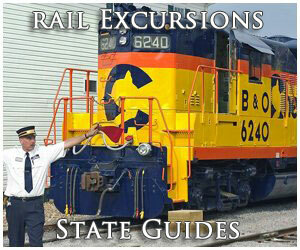 The information presented here highlights Vermont train rides and its few railroad museums. If you are interested in passenger rail options please visit Amtrak's website where you can learn about the Vermonter, which provides service from St. Albans to Washington, D.C. and all major cities in between. Vermont ranks 45th in size at only 9,616 square miles; despite its small stature the state has long been known for its agriculture, excellent cheese, and marble. 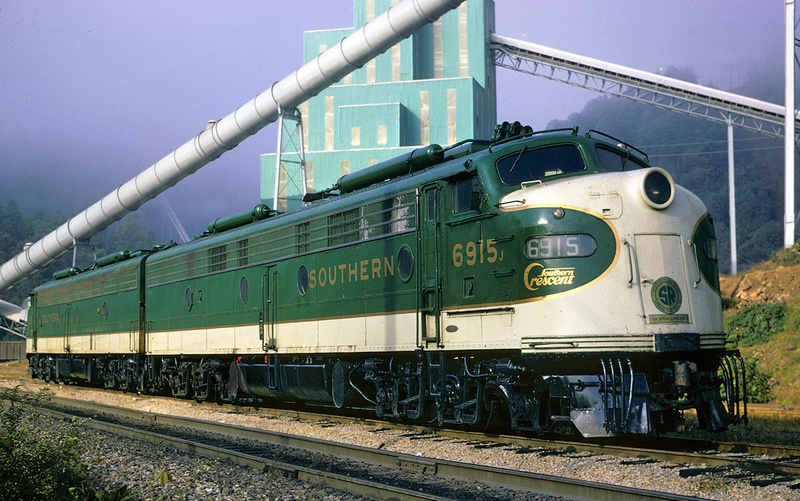 In a time when everything shipped by rail, early promoters recognized its traffic potential in profitably handling these to much larger markets like New York, Boston, and even Montreal, Quebec. The story of Vermont's first railroad begins with the Vermont Central Rail Road's (VCRR) incorporation by the Vermont general assembly in October, 1843. 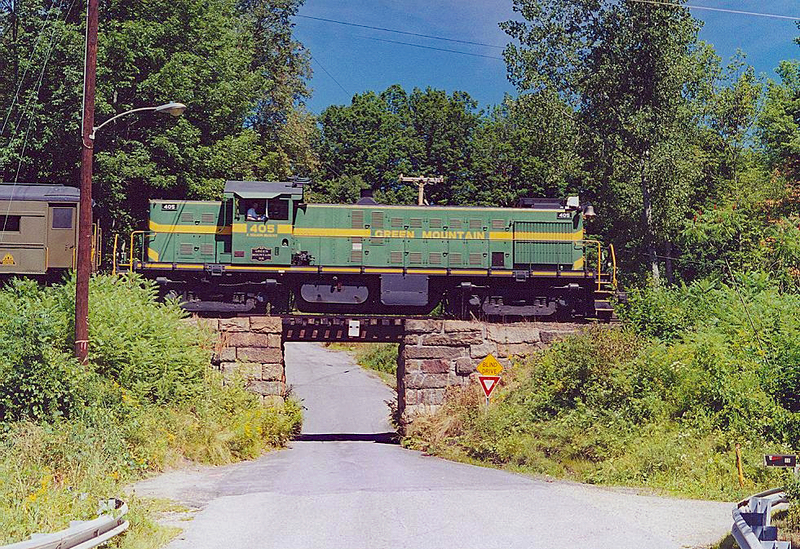 According to Jim Shaughnessy's excellent book entitled, "The Rutland Railroad," the VCRR was conceived by Charles Paine to connect upstate Vermont with southern New England. It would follow the White River near the New Hampshire border (White River Junction) until reaching a location near Montpelier via Northfield. From this point, rails would turn west following the Onion River (now the Winooski River) and reach Lake Champlain at Burlington. The railroad officially began construction in 1845 and the first section opened between Bethel, Vermont and White River Junction on June 26, 1848. The project moved swiftly and was finished to Burlington on December 31, 1849. The VCRR's opening signaled a major defeat for competitor Rutland & Burlington, which only managed to open its first section between Bellows Falls and Burlington that year. The R&B would go on to form the modern Rutland Railroad. 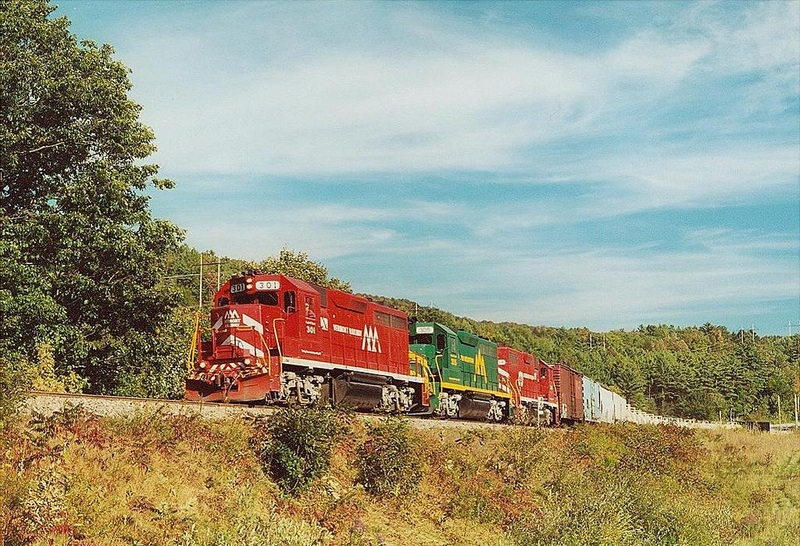 Working with the Vermont & Canada, the VCRR later extended through service to St. Albans/Swanton, Vermont and Rouses Point, New York (the V&C was later acquired by the VCRR). They interchanged at Essex Junction, a few miles east of Burlington. This odd arrangement meant the state's largest city would be served by a branch and the reasoning was entirely trivial; to stifle the R&B and prevent it from establishing a useful through connection. During the 1860's another subsidiary, the Montreal & Vermont Junction Railway, provided Paine's VCRR through service to St. Johns, Quebec where it connected with the Grand Trunk Railway (later Canadian National) to reach Montreal. In the succeeding years, the VCRR continued to grow. Its other 19th century additions included the Sullivan County Railroad (Windsor-Bellows Falls); Vermont Valley (Bellows Falls-Brattleboro); a segment of the Vermont & Massachusetts which extended the VCRR to Grout's Corners, Massachusetts (Millers Falls); and finally, the New London Northern Railroad. All of these properties pushed service to New London, Connecticut and even provided indirect access to New York City via steamship connection across the Long Island Sound. In 1876 the VC discontinued its lease of both the Sullivan County and Vermont Valley railroads and instead acquiring trackage rights over the Connecticut River Railroad (later Boston & Maine). From 1900 until 1988 the-then Central Vermont Railway (CV) utilized such rights from East Northfield Massachusetts to White River Junction. Oddly this arrangement always left the CV's lines in Vermont and those in Massachusetts/Connecticut disconnected. For all of Central Vermont's triumphs, particularly in relation to the Rutland, it faltered prior to 1900. Its peak network constituted over 900 miles, which included controlling its rival and two steamship lines. In 1893 the country was plunged into another financial panic, thrusting the then-Central Vermont Railroad into bankruptcy during March, 1896. It emerged in 1898 as the Central Vermont Railway having dropped all ties to the Rutland and O&LC. The new company was soon acquired by the Grand Trunk Railway by acquiring two-thirds of its stock. The GT never relinquished control and became part of Canadian National Railways in 1922 when the government nationalized a transcontinental network comprising several subsidiaries. 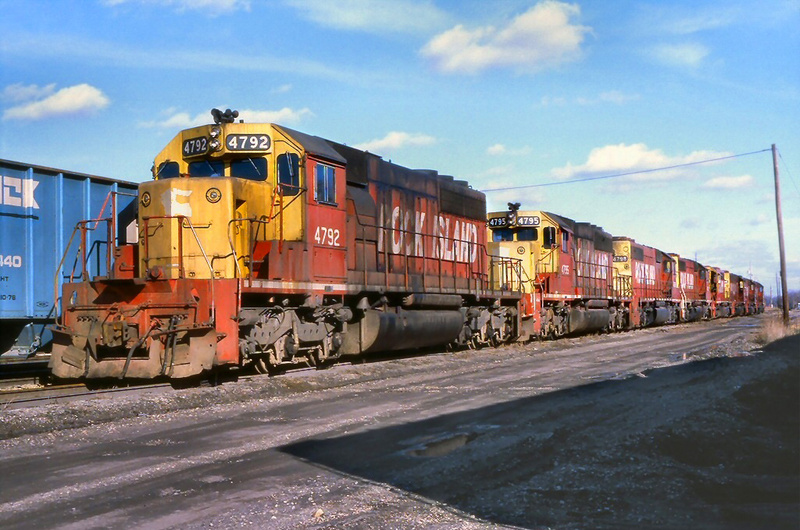 After this time it carried a largely trunk line-only status, operating 325 miles from Montreal to New London in addition to short branches reaching Rouses Point and Richford. To read more about the CV's history please click here. Today, its modern north-south corridor remains in service under the New England Central Railroad, a division of Genesee & Wyoming. The state's most popular excursion and one of the best known across the country, the Green Mountain hosts trips through the beautiful Vermont countryside along segments of the historic Rutland Railroad. It has been in continuous operation since 1964, soon after the Rutland shutdown. Using a forest green and yellow livery inspired directly from the Rutland the Green Mountain was started by F. Nelson Blount to operate his collection of steam locomotives. While Mr. Blount passed away a few years after creating his new tourist attraction (which eventually became part of the National Park Service’s Steamtown, USA located in Scranton, Pennsylvania) the Green Mountain Railroad lived on and split off to form its own operation. 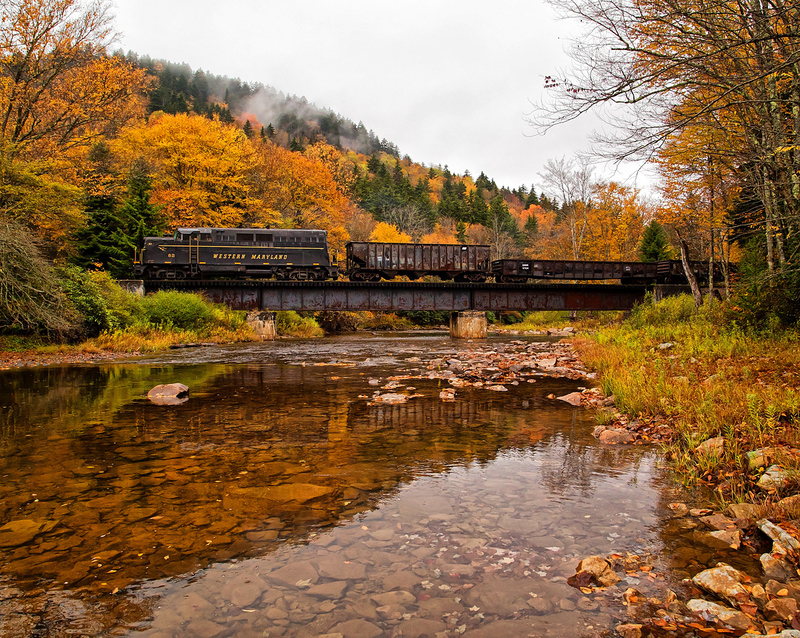 Today, the railroad hauls both passengers and freight and has been widely acclaimed as the top tourist railroad in New England with its spectacular views of the Green Mountain range. 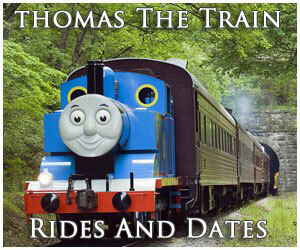 To plan a trip please click here to visit their website. 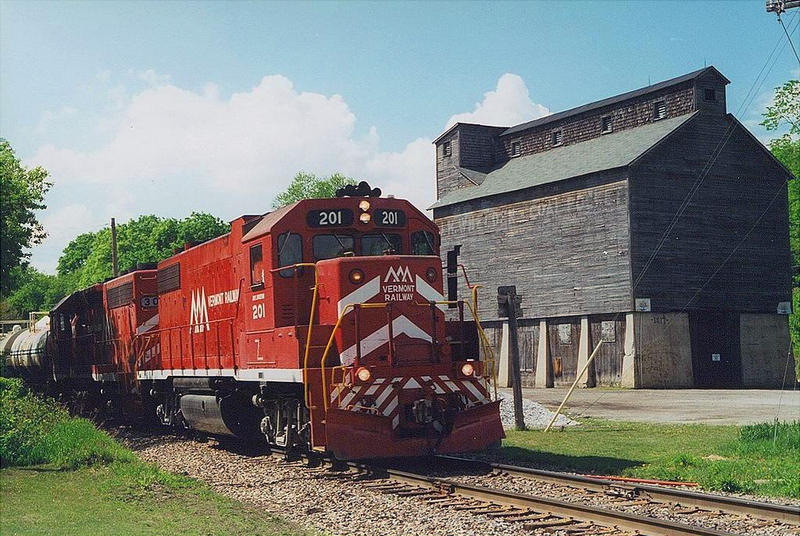 This museum is located in Shelburne and has been in operation since 1947. They house a wide collection of artifacts that span several different subjects; trains comprise only a small component of their pieces. A few of their notable railroad artifacts including Central Vermont 4-6-0 #220 (a 1915 product of American Locomotive's Schenectady Works in Schenectady, New York [this facility later became its primary manufacturing plant), 0-2-2 vertical boiler track inspection car named "Gertie Buck," and an 1890 private business car. In addition they have a preserved Rutland wooden depot constructed in 1890. To learn more please visit their website.